Athetoid or dyskinetic cerebral palsy (10-20% of all cases), which affects the entire body. It is characterized by fluctuations in muscle tone (varying from too tight to too loose) and is sometimes associated with uncontrolled movements (which can be slow and writhing or rapid and jerky). Ataxic cerebral palsy (5-10% of all cases), which involves balance and coordination. People affected may walk with an unsteady gait with feet far apart, and have difficulty with motions that require precise coordination, such as writing. Mixed cerebral palsy is a combination of the above types. Despite remarkable medical advances, the incidence of CP has not decreased, with about one out of 400 children being afflicted with the disorder, which is the most common cause of disability in children. Cerebral palsy, which is difficult to diagnose during early infancy and usually develops by 2-3 years of age, may present from extreme clumsiness to extensive spasticity. Although it is not a progressive condition, the degree of motor impairment, functional consequence, or health-related quality of life may worsen as the child grows older. Patients with CP do not have deformities of the extremities at birth but develop them over time. The most common symptom of CP is spasticity, a complex phenomenon that has been defined as "a motor disorder characterized by a velocity-dependent increase in tonic stretch reflexes with exaggerated tendon jerks, resulting from hyperexcitability of the stretch reflex, as one component of the upper motoneuron syndrome." Its known adverse effects include: inhibition of movement, inhibition of longitudinal muscle, tendon and joint growth, inhibition of protein synthesis in muscle cells, limited stretching of muscles in daily activities, development of muscle and joint deformities. 80% of spastic children have problems at their lower limbs. In particular calf muscle spasticity is one major factor that can interfere with normal walking by preventing heel strike. Other symptoms of CP affecting posture and mobility are: poor muscle coordination, paresis, ataxia, and scoliosis. Many children with cerebral palsy may have accompanying seizure disorders and some level of mental handicap. Further problems paired with CP include disorders of vision, language, and hearing, perception of obstacles, irregular breathing, and eating and drinking difficulties. In about 70% of cases, cerebral palsy results from events occurring during foetal development that can disrupt normal development of the brain. However, trauma at birth can also lead to this condition, and a small number of babies develop brain injuries in the first months or years of life that can result in CP. In most individual cases the exact cause is unknown, yet it has been linked to the health history of both mother and child, as well as to accidents that result in brain damage. Some of the known causes include: intrauterine infections during pregnancy, prematurity, Rh factor incompatibility between the blood of the mother and her foetus, severe jaundice, thyroid disorder, seizure disorder, asphyxia during labour and delivery (fewer than 10% of the cases, despite older theories), rare chromosome disorders, other birth defects. Also, twins are four times more likely to develop cerebral palsy than single births, and triplets are more likely still to develop it. About 10% of children with cerebral palsy develop it within the first two years of life. The most common causes are brain infections (such as encephalitis or meningitis), head injuries, incidents involving hypoxia to the brain (such as drowning), or toxins. To date there is no cure for cerebral palsy, but a variety of therapies are available that may improve the patient's quality of life. Treatment not only depends on the patient's symptoms but also his age. Usually a multidisciplinary team approach is needed to create an individualized treatment plan to help the child reach his or her maximum potential, maximize and coordinate movement, minimize discomfort and pain. Mild spasticity may be treated by physical therapy, such as stretching programs. Some children with CP may benefit from the many mechanical aids available, including shoe inserts, braces, splints, casts, night restraints, walkers, crutches, positioning devices, customized wheelchairs, specially adapted scooters and tricycles. Oral medications with muscle relaxing drugs, including diazepam, dantrolene, and baclofen, sometimes are recommended to ease spasticity or to reduce abnormal movement. Unfortunately, oral drug treatment is often not very helpful. A baclofen pump can also be implanted to deliver the drug directly to the spinal cord, its site of action, allowing more effective spasticity reduction with fewer side effects. Patients with severe muscle contractures may require surgery to lengthen the muscle or selective dorsal rhizotomy, a spinal surgery technique to permanently reduce spasticity in the legs. Botulinum toxin A has been used medically for over 20 years in the management of muscle spasticity. Numerous controlled studies demonstrating its efficacy in treatment of childhood cerebral palsy have led to its approval for this indication in many European countries, and Canada, though not yet in the United States. In the last few years this treatment has been used to: improve motor function and better biomechanical alignment by balancing muscle forces across joints; increase the stretch of the muscle to assist in growth and reduce the risk of permanent contractions; improve health-related quality of life by decreasing spasticity and/or decreasing caregiver burden; decrease pain from spasticity; enhance selfesteem by diminishing inappropriate motor responses; and provide a presurgical diagnostic tool. Following intramuscular injections of botulinum A toxin, shortterm benefits of reduced spasticity are observed in approximately 70-80% of children, with best results achieved in children 7 years old or younger, before fixed contracture develops. The intermediate term (1-2 years) efficacy rate is approximately 50%. Results were measured thanks to 17 instruments, used in studies and trials to assess functional motor abilities, the most reliable being the Gross Motor Function Measure (GMFM), the Paediatric Evaluation of Disability Inventory (PEDI), the Modified Ashworth Scale (MAS), the Gross Motor Function Classification System (GMFM), and the Quality of Upper Extremity Skills Test (QUEST), together with video registration of the child's gait pattern and movements, and interviews with parents and caregivers. The most common deformity treated with toxin injections in paediatric patients with CP is dynamic equinus foot deformity (toe-walking). However, the efficacy of toxin injections for the management of crouched gait, pelvic flexion contracture, cervical spasticity, seating difficulties, and upper extremity deformity also has been documented. In addition, toxin injections have been shown to manage painful muscle spasticity associated with surgery or application of casts and painful cervical spasticity with or without dystonia. Toxin injections can also be used as a diagnostic tool to determine the appropriateness of other interventions by observing the muscle response to the injection in order to gain additional information for the development of a treatment plan. BTA injections are not suitable for all children with CP, though. Favourable factors are: focal goals with specific anticipated functional benefits, and increased dynamic muscle stiffness, while in case of fixed contractures, bony deformities, unstable joints, or too many target muscles results are unsatisfactory. Therefore prospective patients should be selected very carefully by a multidisciplinary team. Besides, being CP such a complex condition, Botulinum toxin has to be placed in context of an overall plan of management and should not be projected as a panacea therapy. Usually, other treatments are recommended to maximize the toxin effects, such as bracing, splinting, serial casting and/or increased physical or occupational therapy, to help take best advantage of the precious time when muscles are weakened, and better improve in range of motion or strength. 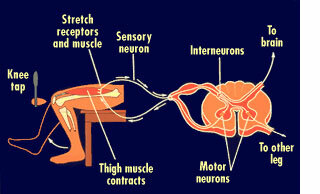 Table of the normal connection between muscle and brain, through the sensory nerve fibres. Injecting β0ToxinA® in such a delicate situation is a team work requiring a paediatrician in charge, who understands CP and its problems, a person trained in Electro-myography techniques (EMG) to assess muscle function (especially in smaller muscles) with an instrument similar to one used to test the heart (ECG or EKG), the degree of spasticity and the number of muscles involved, as well as the degree of internal scissor-like deformity that has already taken place, determine the dose, duration of therapy, and the possible outcome level, and identify clear, reasonable treatment goals. These may include improved motor skills, such as improved ability to stand upright, more stable gait, improved self-care skills, and improved ability to use a power wheelchair, as well as pain reduction and improved positioning or ease of hygiene. Correct identification of the muscle or muscle group in which spasticity interferes with function is all important. Ideally, the toxin should be injected at the site of nerve penetration and arborization to cover the highest concentration of neuromuscular junctions. the tibialis posterior, or other muscles, for diagnostic measure before surgery. Although its most common use is currently for management of toe walking in patients aged 2 to 16 years, evidence is increasing to suggest that botulinum toxin type A plays a role in the management of upper limb spasticity. In particular, persistent thumb-in-palm/ thumb adduction, wrist postures preventing effective hand use, or tight elbow flexion are being treated successfully. There is little uniformity of practice especially as to the optimal dosage and a paucity of data regarding the maximum dose tolerated in the paediatric population. Obviously, the amount of botulinum A toxin required depends upon the number of muscles that are targeted, and the size of the patient. However, a wide variety of doses have been used in studies over the years. In children with mild CP, 8-10 U/kg have been successfully utilized. These doses, though, are often not sufficient to provide relief for many patients who suffer from severe debilitating spasticity. There has been little data regarding the efficacy and safety of BTA therapy in paediatric patients for whom traditional doses are insufficient. Since its first use in children, per kilogram dosages used in clinical trials have been increasing, from 8 to 12 to 24 units or more of β0ToxinA®. A 1999 randomized, double-blind study of "high-dose" versus "low-dose" treatment by Wissel Jet al. was performed to assess dose-response relationships of local botulinum toxin A in 33 patients with spastic gait due to cerebral palsy. The lower limbs were treated comparing a "high-dose" (200 units BTX/A per leg distributed to 4 or 5 muscle bellies) and a "low-dose" (100 units BTX/A per leg) treatment group. Response parameters included changes in muscle tone assessed by the Ashworth scale at knee joint, range-of-motion (ROM) measurements at knee and ankle joint, objective analysis of longitudinal gait parameters as well as subjective assessments of improvement. Patients in both treatment groups showed relevant improvement of Ashworth score and ROM, while gait analysis revealed significantincrease in gait velocity and stride-length in the "high-dose" group compared to the "low-dose" patients, without significantly higher occurrence of side effects. Another study, by Awaad, Yasser et al., published in 2004 and carried out from 1995 to 1999 on a total of 22 CP patients from the movement disorders clinic at Children 's Hospital of Michigan, suggests that paediatric patients can tolerate considerably higher doses than previously thought and that higher doses of up to 40 U/kg of BTX/A may have considerable therapeutic advantages over conventional doses: greater relief for a longer time period (from the traditional 3-4 months to 6-9 months, with a reduced frequency of injections per year from 3-4 times to 1-2 times), which reduces patient discomfort and anxiety and increases the cost effectiveness of the treatment. Moreover, the use of higher doses helps extend this therapy to more severely ill patients who otherwise would not be good candidates for therapy. Furthermore, this study found no evidence that higher doses result in an increase in frequency or severity of complications. The reduction in spasticity occurs within 12-72 hours, with the full effect usually seen 1-2 weeks after the injection, and an average duration of the medical effect of 2-5 months, although functional benefit may last for 6 months or more in some patients. Then injections are repeated accordingly. Botulinum A toxin therapy, when used in appropriate doses, has an excellent safety and tolerability profile. A recent meta-analysis done to discuss the issue of its side effects reported that the overall rate of adverse events was 25%. These diverse events were temporary, mild to moderate, non-systemic and related to action. The primary side effect is temporary weakness of the injected muscles, then temporary, mild discomfort at the injection site, weakening of nearby muscles, generalized leg or arm discomfort due to "stretching" of the previously "tight" muscle. Whole body side effects have been rare, with generalized weakness and fatigue reported in less than 1% of children injected. No cases of a botulism-like syndrome have been reported in children. In small patients receiving leg muscle injections, BTA can lead to short-term stumbling when walking or refusal to walk due to the change in muscle strength. Temporary urinary incontinence has been reported following hip muscle injections in 1% of the children. Autti-Ramo I, Larsen A, Taimo A, von Wendt L. Management of the upper limb with botulinum toxin type A in children with spastic type cerebral palsy and acquired brain injury: clinical implications. Eur J Neurol. 2001 Nov; 8 Suppl 5:136-44. Awaad, Yasser and Tayem, Hassan and Munoz, Sharon and Thomas, Ronald and Soliman, Sherif and Michon, Anne Marie and Minarik, Sarah High dose of botulinum toxin type-A (BTX/A): safety and efficacy in patients with cerebral palsy. Journal of Pediatric Neurology 20042 (2):pp. 91-96. Bakheit AM. Botulinum toxin in the management of childhood muscle spasticity: comparison of clinical practice of 17 treatment centres. Eur J Neurol. 2003 Jul;10(4):415-9. Bakheit AMO, Severa S, Cosgrove A, et al. Safety profile and efficacy of botulinum toxin A (Dysport) in children with muscle spasticity. Dev Med Child Neurol. 2001;43:234-238; erratum 2001;43:357. Berweck S, Feldkamp A, Francke A, Nehles J, Schwerin A, Heinen F. Sonographyguided injection of botulinum toxin A in children with cerebral palsy. Neuropediatrics. 2002 Aug; 33(4):221-3. Fehlings D, Rang M, Glazier J, Steele C. Botulinum toxin type A injections in the spastic upper extremity of children with hemiplegia: child characteristics that predict a positive outcome. Eur J Neurol. 2001 Nov; 8 Suppl 5:145-9. Galli M, Crivellini M, Santambrogio GC, Fazzi E, Motta F. Short-term effects of "botulinum toxin a" as treatment for children with cerebral palsy: kinematic and kinetic aspects at the ankle joint. Funct Neurol. 2001 Oct-Dec;16(4):317-23. Kalinina LV, Sologubov EG, Luzinovich VM, Dutikova EM. [Botox in combined treatment of cerebral palsy in children] [Article in Russian] Zh Nevrol Psikhiatr Im S S Korsakova. 2000;100(12):60-3. Koman LA, Mooney JF 3rd, Smith B, Goodman A, Mulvaney T. Management of cerebral palsy with botulinum-A toxin: preliminary investigation. J Pediatr Orthop. 1993 Jul-Aug;13(4):489-95. Koman LA, Paterson Smith B, Balkrishnan R. Spasticity associated with cerebral palsy in children: guidelines for the use of botulinum A toxin. Paediatr Drugs. 2003;5(1):11-23. Koman LA, Smith BP, Shilt JS. Cerebral palsy. Lancet. 2004;363:1619-1631. Linder M, Schindler G, Michaelis U, Stein S, Kirschner J, Mall V, Berweck S, Korinthenberg R, Heinen F. Medium-term functional benefits in children with cerebral palsy treated with botulinum toxin type A: 1-year follow-up using gross motor function measure. Eur J Neurol. 2001 Nov;8 Suppl 5:120-6. Mall Volker, Kirschner Janbernd, Linder Michaela, Schindler Gudrun, Berweck Steffen, Stein Sabine, Michaelis Ulla, Bernius Peter, Korinthenberg Rudolf, Heinen Florian. Botulinum toxin A in children with cerebral palsy: evaluation of therapy using the Pediatric Evaluation of Disability Inventory (PEDI) Journal of Pediatric Neurology 2003; 1(1): 29-34. Nolan Karen W, Cole Lynn L, Liptak Gregory S. Use of Botulinum Toxin Type A in Children With Cerebral Palsy Physical Therapy Volume 86 Number 4 April 2006. Polak F, Morton R, Ward C, Wallace WA, Doderlein L, Siebel A. Double-blind comparison study of two doses of botulinum toxin A injected into calf muscles in children with hemiplegic cerebral palsy. Dev Med Child Neurol. 2002 Aug;44(8):551-5. Pratibha Singhi, Munni Ray Botulinum toxin in children with cerebral palsy. The Indian Journal of Pediatrics Year : 2004 Volume 71 Issue 12 Page 1087-1091. Wissel J, Heinen F, Schenkel A, Doll B, Ebersbach G, Muller J, Poewe W. Botulinum toxin A in the management of spastic gait disorders in children and young adults with cerebral palsy: a randomized, double-blind study of "high-dose" versus "low-dose" treatment. Neuropediatrics. 1999 Jun;30(3):120-4. Zurcher AW, Molenaers G, Desloovere K, Fabry G. Kinematic and kinetic evaluation of the ankle after intramuscular injection of botulinum toxin A in children with cerebral palsy. Acta Orthop Belg. 2001 Dec;67(5):475-80.
http://www.cerebralpalsy.org/ and http://www.aacpdm.org/index?service=page/Home (American Academy for Cerebral Palsy and Developmental Medicine - AACPDM).